Ida Minerva Tarbell (November 5, 1857 – January 6, 1944) was a teacher, an author and journalist. She was known as one of the leading "muckrakers" of her day, work known in modern times as "investigative journalism." She wrote many notable magazine series and biographies. She is best-known for her 1904 book The History of the Standard Oil Company, which was listed number five among the top 100 works of twentieth-century American journalism by the New York Times in 1999. Her writing on the oil industry led to the break-up of Standard Oil and to the passing of antitrust laws in the United States of America. 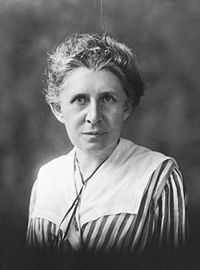 Tarbell also wrote several books for women, and supported the peace movement after World War I.
Ida Tarbell was born in a log cabin in Erie County, Pennsylvania. She grew up in the western portion of the state where new oil fields were developed in the 1860s. She was the daughter of Frank Tarbell, who built wooden oil storage tanks and later became an oil producer and refiner in Venango County. Her father's business, and those of many other small businessmen was adversely affected by the South Improvement Company scheme around 1872 between the railroads and larger oil interests. Later, she would vividly recall this situation in her work, as she accused the leaders of the Standard Oil Company of using unfair tactics to put her father and many small oil companies out of business. Ida graduated at the head of her high school class in Titusville, Pennsylvania. She majored in biology and graduated from Allegheny College, where she was the only woman in the class of 1880. After graduating from college, Ida began her career as a science teacher at Ohio Poland Union Seminary. However, she found her life's work in writing, and changed her vocation after two years, and returned to Pennsylvania, where she began writing for Chataquan, a teaching supplement for home study courses. By 1886, she had become the managing editor. In 1891, at the age of 34, she moved to Paris to do post-graduate work and write a biography of Madame Roland, the leader of an influential salon during the French Revolution. While in France Ida wrote articles for various magazines. While doing so Ida caught the eye of Samuel McClure earning her position as editor for the magazine. She went to work for McClure's Magazine and wrote a popular series on Napoleon Bonaparte. Her series on Abraham Lincoln doubled the magazine's circulation, and was published in a book. These established her reputation nationally as a leading writer. Tarbell had grown up in the western Pennsylvania oil regions where Henry H. Rogers had begun his career during the American Civil War. Beginning in 1902, she conducted detailed interviews with the Standard Oil magnate. Rogers, wily and normally guarded in matters related to business and finance, may have been under the impression that her work was to be complimentary. He was apparently unusually forthcoming. However, Tarbell's interviews with Rogers formed the basis for her negative exposé of the nefarious business practices of industrialist John D. Rockefeller and the massive Standard Oil organization. Her work, which became known at the time as muckraking (and is now known as investigative journalism), first ran as a series of articles, presented in installments in McClure's Magazine, which were later published together as a book, The History of the Standard Oil Company in 1904. Tarbell's exposé fueled negative public sentiment against the company and was a contributing factor in the U.S. government's antitrust legal actions against the Standard Oil Trust which eventually led to the breakup of the petroleum conglomerate in 1911. 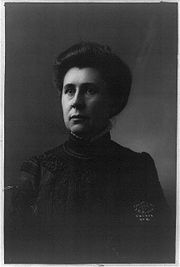 Ida Tarbell; this photograph was taken sometime between 1910 and 1930. Tarbell and most of the rest of the staff left American Magazine in 1915. After that time, although she also contributed to Collier's Weekly, a large part of Tarbell's schedule began to include the lecture circuit. She became interested in the peace effort, serving on many committees. She continued to write and to teach biography. She published a 1926 interview with Benito Mussolini. She also wrote several books on the role of women including The Business of Being a Woman (1912) and The Ways of Women (1915). Her last published work was her autobiography, All in the Day's Work (1939). Many of her books were to help women during their time of despair and hope. Ida Tarbell died of pneumonia on her farm in Connecticut at the age of 86 in 1944. Ida Tarbell was a pioneer in investigative journalism. She was highly critical of large corporations like Standard Oil, which she felt were immoral and exploitive. Her work would help to bring down the oil magnate in the end. Tarbell was also interested in the peace movement. She is remembered as a talented writer and groundbreaking reporter. In 1999, her 1904 book The History of the Standard Oil Company was listed number five among the top 100 works of twentieth-century American journalism by the New York Times. In 2000, Tarbell was inducted into the National Women's Hall of Fame in Seneca Falls, New York. On September 14, 2002, the United States Postal Service issued a commemorative stamp honoring Tarbell as part of a series of four stamps honoring women journalists. "Imagination is the only key to the future. Without it none exists, with it all things are possible." ↑ Ida M. Tarbell, All in The Days Work: An Autobiography (New York: Macmillan, 1939), 1. ↑ United States Postal Service, Postal Operations-2002, Stamp Program Retrieved January 31, 2008. Tarbell, Ida M. All in The Days Work: An Autobiography. New York: Macmillan, 1939. Tarbell, Ida M. The History of the Standard Oil Company. 2 vols. New York: McClure, Phillips & Co., 1904. The History of the Standard Oil Company Retrieved January 31, 2008. United States Postal Serviice. Postal Operations-2002. Stamp Program Retrieved January 31, 2008. All links retrieved February 23, 2018. New York Times, February 13, 1916, "Our Rich Authors Make Cheap Literature; Ida M. Tarbell Laments Tendency of Some of Our Modern Writers to Sacrifice Their Independence and Self-Respect for the Sake of High Prices"
History of "Ida M. Tarbell"
This page was last modified on 23 February 2018, at 23:24.